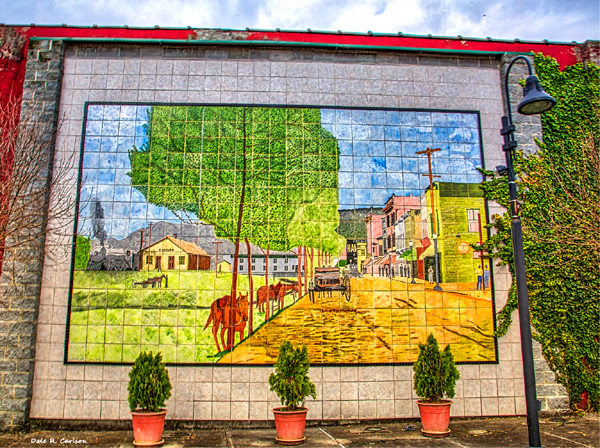 Featured Mural - "Crooked Road Mural"
The downtown Coeburn mural is made of ceramic tiles that were painted with glazes then fired into the tiles and attaching the tiles to the block wall. The image of the mural is that of downtown Coeburn as it appeared over 100 years ago. The image was created from a drawing and a watercolor painting based on old photographs of the area from the same location where the mural is located. The viewer of the mural can compare how downtown Coeburn looks today to how it looked over a 100 years ago. That image was selected because the town had recently celebrated its centennial (1892 -1992) and the scene is a reminder of that milestone. The mural came about as part of the downtown revitalization project that was underway in the 1990s and 2000s. The project included removing blight, new store fronts, lighting, and more. From all that, a vacant lot was created where the mural was located. A small watercolor painting was selected to be the image of the mural. It was determined that the mural would be 24 x15 feet in size. An area billboard company enlarged the watercolor to that size. A couple (Kathleen and Jim Carlton of Kingsport Tn.) that had the ability to fire glazes into ceramic tiles were hired to paint the 1 x 1 foot tiles and attach them to the wall. The enlarged print was then cut into one foot squares, and from them the images were drawn on each tile and then painted with glazes and fired. They then brought the tiles to Coeburn and attached them to the wall creating the mural. The enlarged watercolor painting is also added to the Appalachian Mural Trail. It is located inside the Lay�s Hardware Center for the Arts in Coeburn. Charlie McConnell, the artist for both murals, is a musician & artist and serves on the Crooked Road Board of Directors. The Lays Building is an amazing stop on the Crooked Road. The Crooked Road is a place of beauty a place of song. Music is woven into the rich tapestry of tradition in Southwest Virginia and now these art murals add another dimension. You can visit old-time string bands, a Capella gospel, blues, 300 year old ballads, bluegrass, and more along The Crooked Road, now combined with the richness of art.